LO loves gummy snacks...especially sour ones! i admit, i usually have a bag of gummy candies in the pantry. i don't dare read the ingredients on the bag. i know it's chock full of bad stuff. duh, it's candy! but, a little now and again won't hurt. not to mention, it can get my kid to do things he otherwise refuses to do. hey, don't judge! i've got my hands full these days with the new baby. sometimes offering a few gummy bears to get LO dressed and out the door in time for preschool is all i can do to keep the peace. so, when i came across this recipe from mommypotamus, i was thrilled and eager to try it. it's super simple, healthy, fast, and fun for the whole family! i tweaked the original recipe a bit. first, i doubled it, because i knew we'd eat half while making them. i was right! then, i added a little water for a softer consistency. 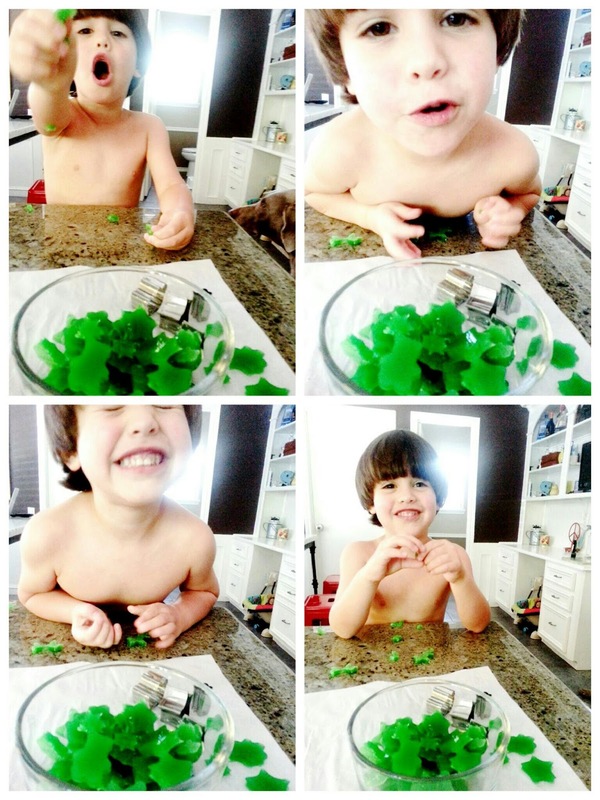 for fun shapes, you can use a silicone mold or small cookie cutters. we used the cookie cutters for an inexpensive first attempt. if you use the cookie cutters, you'll need a baking dish to set the mixture before cutting shapes. the bigger the dish the thinner the snack. with this recipe, i wouldn't use anything bigger than a 9' x 11'. because we love them so much, i ordered a mold for fast batches. although, we will keep using the cookie cutters for the fun factor. as for the coloring, i used a vegetable based food coloring to take these the next "healthy" level! you can use any kind of gelatin, but you'll probably need to buy it online because of the amount you'll need. i used a grass-fed gelatin (i told you these were all natural). you can switch up the liquid and use any kind of juice. for the next batch, i'm going to try water with vanilla extract and maple syrup for a sweet version. oh, the possibilities! whisk all liquid and honey in a small saucepan over low heat. sprinkle in gelatin while whisking until dissolved. don't worry if you get any clumps...just keep mixing. remove from heat when mixture is blended. add drops of food coloring until you get the color you want. spoon into molds or pour into a flat surfaced baking pan (i used a 9x9) and place into the freezer for 8 minutes. then, remove snacks from molds or get to cookie cuttin'! they will stay solid at room temperature. mommypotamus says they'll keep for 2 weeks in the fridge. did you like this post? leave me a comment or share with a friend by clicking one of the links below!